The sweet and lovely Emiline is hosting her first food event: St. Paddy's Day Pub Crawl!! It took me a while to decide what to prepare for the event (today is the deadline to take part in it) because I wanted something with a Brazilian feel. 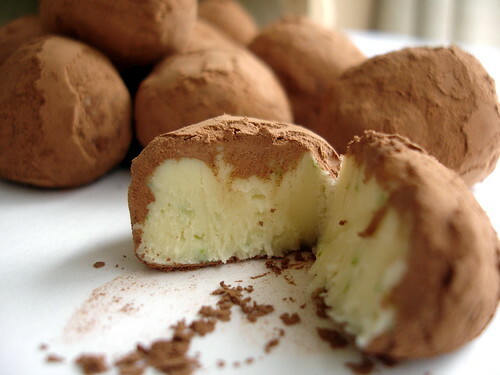 Finally, I went for these caipirinha truffles (the ones I had previously in mind when I made these). I think the truffles are OK, but not as good as I expected. The cachaça flavor was strong and I think some lime juice would have worked well to replace part of the liquor. Emiline, I hope you like my Brazilian booze recipe! Combine chocolate, zest and cream in a heatproof bowl; place it over a saucepan of gently simmering water. Stir until chocolate is melted. Remove from heat, add the cachaça and mix vigorously until mixture is silky and smooth. Cover with cling film and refrigerate for 2-3 hours or until firm enough to form balls. Scoop out rounded teaspoons of the mixture (while it’s still cold and firm) and form balls – you don’t want your truffles to be perfectly rounded. 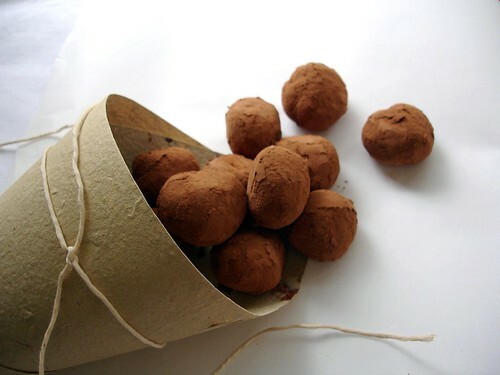 Roll the truffles in cocoa powder and place in small fluted paper cases or on a plate. Keep refrigerated. * Once again, I used a type of cream we have here that is packaged in small Tetra Pak boxes; it contains 25% fat. I did it to avoid wasting an almost full jar of heavy cream. I love boozie sweets and the addition of cachaca sounds fab! Hey, I'm into boozy chocolates, so these look great to me! I love having both chocolate and white chocolate truffles. Great entry and a job well done. Patricia, these look delicious! I love truffles, and the liquor is just an added bonus. Happy St. Patrick's Day! Capirinha and chocolate! What a combination. Very inventive Patricia. Yum yum, Patricia -- these look so delicious! I love caipirinhas and chocolate...what a great idea for a combination of the two. Those look so good! I like that they are white chocolate (my favorite). The Caipirinha sounds interesting. Oooh, I'm sending this recipe to my friend Peter who owns a pousada in Minas Gerais. This is just his kind of thing! You can never go wrong with truffles. These look so lush. 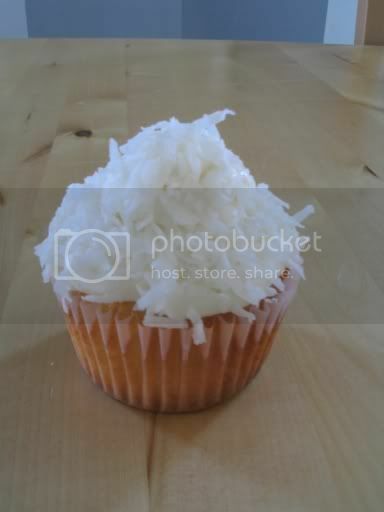 these look so good, and im sure a bite into one would take me travelling away somewhere very sunny! oh yum! i had goat cheese truffles this week from the farmer's market that were out of this world -- there is nothing better than a little cocoa-covered truffle! Those look amazing! Making truffles scares me, so I have yet to give them a try. Emiline, I'm so glad to hear you like these! Tks! Amy, caipirinhas are the best! Hi, sweetie! I'll check yours out. Katy, those truffles sound so unusual! Very interesting truffles and they look pretty! caipi truffles!! that is the way to go! The ones I made today look rather plain in comparison! lol! seriously though i do like the sound of this one! These are beautiful! The Caipirinha sounds interesting. I don't think I could just eat one! Beautiful styling. If you made 35 truffles, I think you should have enough to send us one each. You can't possibly eat all of those! Boozy and amazing...what a flavour combo. Love that last image of them, softly dusted. Ooo wow these look good with the white chocolate hidden inside. Gosh! They look like heaven to me! Beautiful. This makes me wanna be more Irish than I already am. What a fantastic dessert. Those look dangerous! I could just keep eating them! I love liqueur chocolates yum! I'm intrigued by this cachaca Pat... As usual, your sweets make me drool...! Wow, this sounds unusual but delicious. I love booze chocolates. =) Thanks for sharing! Meeta, I am sure your truffles are scrumptious! Lucy, thank you. I'm glad you like these. Carol, have as many as you want, my dear friend. Vanessa, I'll see that later, tks! Ashley, I love white chocolate. Stef, thank you for visiting! Great combination! If only our computer had a push button delivery feature!! 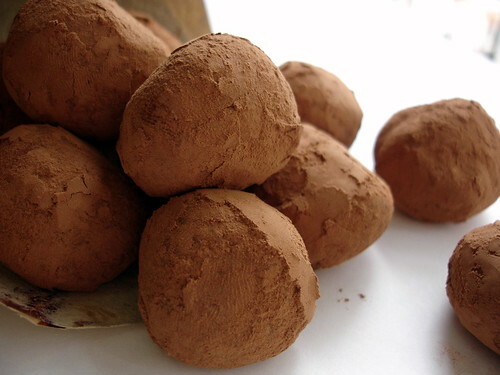 These truffles look amazing! especially in that last photo - so good! I love both truffles and caipirinhas! I must try your recipe... sounds nad looks delicious! Oh my!!! I love recipes that play around with ingredients (being from the Midwest of the US, cachaça is still a very new thing for me - I'm still perfecting my caipirinhas)! On my gotta try list! yum. i am all about foods invovlving hard liquor :) those look amazing. wow, i have to try these patricia! they look so good! I've had caipirinhas before and loved them. They remind me a little of daiquiris. The rich white chocolate and cream must taste marvelous w/ the cachaça. Gorgeous treats! ay-yi-yi!! these look yummmmmy! i'm drooling on myself. however, if i was anywhere NEAR these after i'd been drinking, i would probably overdose on them. Wow. I haven't read any food blogs in a little while, and I can't believe I missed these! I was dying for you to try these when you made the lemon truffles a while back. Sooooo excited & now I'll really have to go hunting some cachaca to try them out! booze and chocolate? now you're talking! Thank you so much and i go visit blog all day. Mmmmm that inside shot of the truffles is just tantalising! It's breakfast time here and I am now craving chocolate truffles!